I remember when the movie, Fried Green Tomatoes, came out. I remember buying the video because I’d fallen so in love with it. I watched it over and over and wore out the VHS tape. I bought another. I was in love with Idgie, and with Ruth, and with their love story. I was in love with the town of Whistle Stop and all of it’s characters/residents. So when a friend saw that I was doing the 2016 Reading Challenge and that one of the categories was a book where you’d seen the movie but hadn’t read the book, and she suggested this book, I leapt at the chance. Now, at this point it’s been several years since I’ve seen the movie (probably ten, maybe more!). I had never forgotten the story, but it was hazy enough that the book felt fresh and wonderful to me. I am still in love with Idgie and Ruth and their love story. I think it’s one of the most beautiful love stories around. The book goes even more beautifully in-depth with their love story, where the movie danced around it a bit – a product of the era it was produced in, I suppose. But while the movie made you constantly wonder if they were just really close friends, the book lays it out plainly. They were in love, madly in love, beautifully in love. One of the best parts of reading the book, for me, was being able to see how they gloried in their time together once they were able to throw off the expectations of society (for Ruth) and just be together. Something interesting, too – in the movie, it was constantly implied that Ninny – the elderly lady telling the tale – and Idgie were the same person. But in the book it makes it very, very clear that they are not the same person – though they come from the same family, Ninny having been married to one of Idgie’s brothers. Which makes the ending of the movie rather different than the book. The book made my heart ache and made me incredibly sad, even though the message of the book is one of hope. 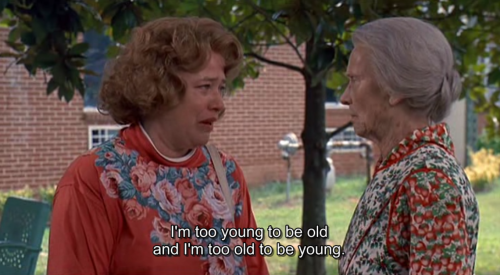 Being in a different place in my life now, I suddenly related to the character of Evelyn a whole lot. Evelyn of course, being the woman that Ninny tells her story to, the story of Whistle Stop and of Ruth and Idgie, and the entire cast of characters that fills out the whimsical little town. Lost in her 40’s, feeling directionless, feeling helpless, and not really knowing herself very well, Evelyn learns to live again through the stories of the people at Whistle Stop and the unfailing encouragement of her new friend, Ninny. And while I’m not in quite as hopeless of a place as Evelyn, I could relate much more than I could as a teenager! “Lately, it had been an endless procession of long, black nights and gray mornings, when her sense of failure swept over her like a five-hundred-pound wave; and she was scared. But it wasn’t death that she feared. She had looked down into that black pit of death and had wanted to jump in, once too often. As a matter of fact, the thought began to appeal to her more and more. She even knew how she would kill herself. It would be with a silver bullet. As round and as smooth as an ice-cold blue martini. She would place the gun in the freezer for a few hours before she did it, so it would feel frosty and cold against her head. She could almost feel the ice-cold bullet shooting through her hot, troubled brain, freezing the pain for good. The sound of the gun blast would be the last sound she would ever hear. And then… nothing. Maybe just the silent sound that a bird might hear, flying in the clean, cool air, high above the earth. The sweet, pure air of freedom. This book is very life-affirming, even with the inevitable deaths of characters (after all, the book spans from the 1920’s through the 1980’s and even the best characters aren’t all immortal). It’s very love-affirming in the love-will-find-a-way way. It’s very engrossing, if you enjoy character-driven novels. It’s got a little bit of mystery, a little bit of romance, a little bit of history, so it’s a book that can please people looking for all sorts of things. It was also a very fast read for me. Probably because I had such a hard time putting it down. It’s peppered throughout with little bits of southern-style wisdom, and beautifully, at the end of the book, it’s also dosed heavily with recipes you’ve been reading about through the book, including one for fried green tomatoes. Worth a read, and would be a fantastic vacation or beach book!